Russians love omens and fairy tales, thus it shouldn’t come as a surprise that many places in Russia are thought to bring good luck, happiness and love. It is thought that travel to such a place could become a potential turning point in one’s life. Here is a list of the happiest corners in Russia. Mount Svetelka is located in the Samara Region near the Volzhsky Utyos (Volga Cliff) Sanatorium. Svetelka’s energy is often compared to that of Stonehenge or the Mayan Pyramids. Scientists believe that the route to the sanatorium passes between two geological plates with a powerful geomagnetic radiation that actively affects the energy of a person and can restores it. People who have visited Svetelka have remarked that they easily crossed many kilometers of trails through forests, ravines and daily climbs on the mountains without experiencing shortness of breath, fatigue or osteochondrosis. Many come to find inner peace and to gain strength in pursuing their dreams. According to legend, in order to fulfill a wish it is necessary to conduct a ceremony. This entails taking five rocks without chips or scratches to the summit of a mountain and from there throwing the stones in five different directions symbolizing love, health, the fulfillment of dreams, luck and for financial prosperity. If the rock falls straight and does not roll, the wish will be granted. It is believed that the ancient village of Kolyvan and its residents are under the protection of saints. The village is listed in the register of Russia’s historic settlements and attracts many pilgrims. The heart and symbol of Kolyvan is the rural church of Prince Alexander Nevsky located on the grounds of the Intercession of Alexander Nevsky Convent. Travelers and residents believe that if one treats the holy Apostle Peter with pure thoughts then he will provide help in business and one’s personal life. Residents lovingly call Kolyvan “the city by the water” and the local river is famous for its fishing spots. It is situated on a hill as if open to all guests. The Moscow-Siberian highway, once the longest road in tsarist Russia, was located here. It is noteworthy that the Altai Mountains also have its own happy place called Kolyvan surrounded by pine forests and clean air. This Kolyvan is best known for its concentration of stone-carving specialists that have given the world many beautiful works of art, with several decorating the Hermitage in St. Petersburg, as well as palaces and parks. Located nearby is Kolyvanski Borok, a beautiful corner of the world with an abundance of clean air and herbs. Just beyond there is the Kolyvanski Ridge and the holy Mount Sinyukha with the White Lake at its bottom. In the mid-18th century, pilgrims climbed Sinyukha, a mountain that appears dark blue because of the thick fir forest, and performed prayers near a granite bowl that is always full of water. Some believe that the source of the northern slope of Sinyukha is holy and that its water contains healing properties. Supposedly when the ill climbed the mountain and prayed for recovery, they were cured of their ailments. Pilgrims and tourists alike visit the holy source near the tomb of St. Seraphim of Sarov near the old merchant town of Arzamas. It is believed that here John the Evangelist, one of the 12 Apostles and author of the Gospel of John, himself served as a patron. The healing properties of this source are known all over the world. The public garden in the courtyard of the Philosophy Department at St. Petersburg State University at 11 University Embankment can also bring you good luck. On the steps in front of the office of translation is a hippo, endearingly called Tonya, which embodies power and prosperity. According to legend and many witnesses, the hippo can help you find a soul mate. All that is required is the performance of a simple rite: in order to find a groom, hold Tonya’s right ear, and to find a wife, hold her left. Students of philosophy as well as foreign visitors come here in the hopes of achieving family happiness. Muscovites go searching for good luck at the modest-looking bronze statue of a border guard with a dog at metro station “Ploshchad Revolutsii” (Revolution Square). For more than 70 years many have believed that rubbing the dog’s nose would bring good fortune. Just seeing how smooth the dog’s nose has become, it seems that more than a few believe it. Metro staff say that during the semester lines of students often form hoping to touch their assignments to the dog’s nose and thereby pass their exams successfully. 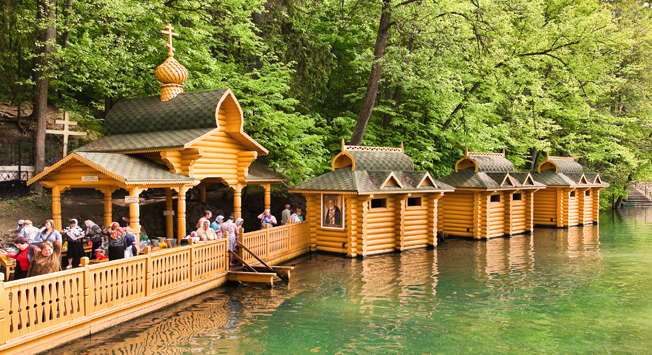 People travel to Lake Svetloyar and Diveyevo village in Nizhny Novgorod Region to purify their souls from all that is bad and to come under the protection of the Blessed Virgin. Indeed, Diveyevo village is considered her fourth and final residence. The relics of Saint Seraphim of Sarov are also located in Diveyevo. Local residents think that the lake has healing properties and that those who look into it and see the reflection of the gold church domes will find happiness. The water from the lake has long been stored in containers without losing its properties and palatability. It is believed that on the night of Ivan Kupala (a midsummer folk festival of pagan origin), water in the pond acquires magical properties. Eyewitnesses, including scientists, have observed an inexplicable phenomenon. During the celebration the sound of chimes playing have been heard originating from Lake Svetloyar. Local residents attribute this to the legend of the invisible city of Kitezh, which did not fall to invaders many centuries ago, but instead disappeared underwater. Another theory is that Kitezh was simply transported to another dimension.